It’s been quiet around the blog the last few months because I have been neck deep in work getting a new product ready. I’m slowly resurfacing and as blogged about the last few days we (OnTime) are now shipping the latest release of the group calendar product called OnTime Group Calendar 2011. We showed of the UI’s at Lotusphere 2011 but now we’re shipping and are ready to go. Besides having a brand new backend with it’s own interesting features and performance improvements (see here) the product also ships with a brand new, all Java, Notes UI that runs full screen inside the Notes client. 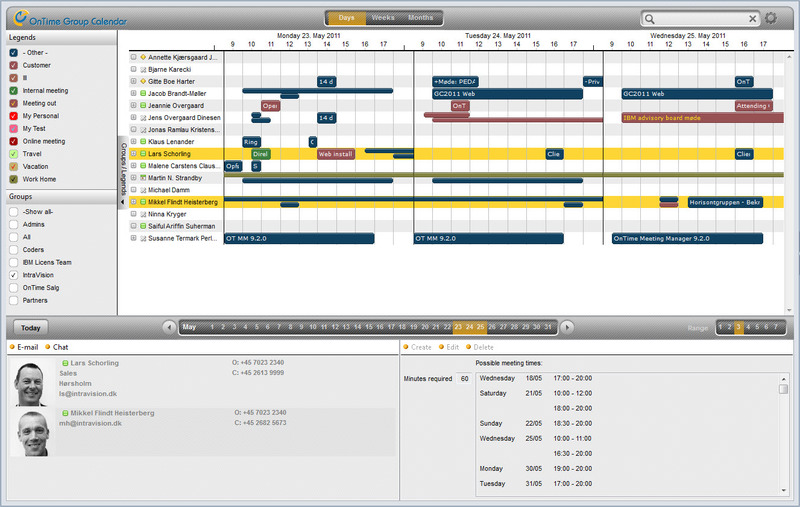 The client is called OnTime Group Calendar 2011 – Notes (or Notes 2011) and is a good showcase of what’s possible inside the Notes client and why choosing Eclipse as the platform for Notes 8 was important. We no longer have to use separate clients for our UI but can run it inside Notes where it belongs. The below screenshot shows the UI running inside Notes 8.5.2. Since the group calendar now runs full screen (a perspective in Eclipse Java parlance) it’s launched from the Open menu in Notes. Once opened it adds its own top level OnTime menu and loads data using the new OnTime Group Calendar API. One of the cool things about the UI being in Java is that it does away with the traditional Notes view limitations (for instance one document per row) and allows for some super cool, pixel level, UI drawing. It also allows us to read from an API layer that abstracts the actual reading and providing of data from the application itself and allows us to reuse the API in all our UI’s (Notes 2011, Discovery 2011, Web 2011, Mobile 2011 and Team-At-A-Glance 2011 (sidebar)). The UI allows the user to switch between a day view (see above) where the user may choose to see from 1 to 7 days to a week view to a month view. The week view for instance gives a very nice overview of the calendar of the people you work with. In all the views you may filter the people shown using groups and legends. Legends are what we call the types of appointments/meetings being shown. On the server you configure what makes an appointment be put in what legend and may be based on category, type or a formula you specify. Once you select one or more legends the viewer is filtered to highlight the appointments/meetings that match the legend. Below I have chosen to only see external meetings. Besides the cool and slick UI (if I have to say so myself) we also provide some nice new functionality. If you have write to a calendar (your own or a colleagues) you may drag’n’drop appointments in the group calendar. The below screen shot shows me dragging an appointment from Susanne to Saiful. The Notes 2011 also allows for full Lotus Sametime integration and customization using Eclipse based extension points but that’s a topic for another day. If you like to try out OnTime Group Calendar 2011 you may obtain an unrestricted, 30 day, trial. Simply drop us an e-mail at sales@intravision.dk. We’ll even be happy to offer you 20% discount for all new licenses purchased in May or June as an introductory offer. Just tell us that you learned about OnTime on lekkimworld.com and we’ll discount your purchase. Awesome Mikkel, great job! I know you put in a lot of work to get this out the door. Well worth it. Cool stuff Mikkel!! To play devils advocate, wouldn’t the same have been possible if another technology had been chosen? Probably although the fact that it’s an open, extendible, platform does make a difference. My point was that it was a good thing to change the old client written in C to something that is easily extended. This is really awesome, Mikkel! Really nice app.